Shoulder problems often impact people as they age because the soft tissues in that area break down more quickly. However, sports, work and other injuries can cause shoulder problems at any age. Fortunately, scientists are working on ways to prevent and treat shoulder pain and other issues. This includes new treatments, medicines and a more modern approach in orthopedic surgery. Following are the most common shoulder conditions and the treatments most often used to help relieve pain and improve function. Osteoarthritis involves the wearing down of the cartilage, while rheumatoid arthritis is an autoimmune disease that causes joint inflammation. Both can impact the shoulder. People with osteoarthritis of the shoulder are often advised to take nonsteroidal anti-inflammatory drugs (commonly known as NSAIDs), including ibuprofen. Those with rheumatoid arthritis may be prescribed corticosteroids. Physical therapy can also help. If these treatments don’t work, surgery may be recommended. People can “dislocate” their shoulder if it is pulled or twisted. The ball-shaped upper arm bone pops out of the socket that holds it in place. This is one of the shoulder injuries more likely to impact young people. Sports medicine physicians see a lot of dislocated shoulders. The first step to treating a dislocated shoulder is for the doctor to put the ball back in its socket. Patients are often given a sling or other medical device to hold the shoulder in place as it heals. They’re advised to place ice on the area, rest and do exercises to strengthen the area, return the range of motion and help prevent another dislocation. If the nerves and tissues in the shoulder region were injured as well, patients may require surgery. Shoulder fractures usually involve the upper arm or collarbone. They’re generally caused by the shoulder being struck or a fall. As with many bone fractures, doctors re-position the bone and put the patient in a sling or other device to allow it to heal. Only then is exercise prescribed. In more serious cases, surgery may be required. This condition has also been termed “50 Shoulder” because it often occurs in people around that age. It seriously impacts shoulder mobility. It can be caused by problems in the shoulder joint, worsening rheumatic disease or lack of use, such as when someone is in chronic pain. The condition can be improved with NSAIDs, gentle stretching and heat. Sometimes doctors give injections of cortisone or use electrical stimulation. If none of these treatments help, surgery may be recommended. The rotator cuff sits at the top of the shoulder. As its name implies, it allows the shoulder to rotate. A tear in the cuff can be very painful. People sometimes get this injury from reaching out their hand to break a fall, particularly if they are running. Tears can also result from repeated overhead motion. Sometimes the cuff tears simply because the tendons have worn down as someone age. Treatment depends on the severity and duration of the injury. Rest, range-of-motion exercises, cold or heat and anti-inflammatory medications are common treatments. Doctors may give the patient cortisone injections, ultrasound to improve blood flow and warm the tissues and electrical stimulation. If these do not heal the tear, surgery may be needed to repair it. Bursitis and tendinitis are common rotator cuff diseases. With bursitis, the bursa, which is a small sac filled with fluid that protects the shoulder joint, becomes inflamed. Activities that involve reaching overhead can cause bursitis. With tendinitis, the tendons become inflamed. The two conditions may occur together. The treatments are basically the same as for a rotator cuff tear. Again, if the condition does not improve, the doctor may recommend surgery to alleviate the pain and restore the patient’s mobility. A “separated” shoulder actually refers to a tear in the ligaments between the shoulder blade and collarbone. This, like some rotator cuff tears, can occur when someone reaches out to break a fall. It can also happen if the shoulder is struck. 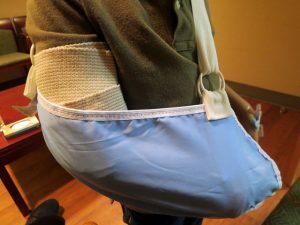 A patient may be given a sling or other device to hold the shoulder in place. Rest and ice are also recommended, followed by some prescribed exercises. These usually help heal the tear unless it is severe. Then surgery may be needed. In all of these cases, surgery is always the last resort. Experienced Jacksonville orthopedic surgeons and sports injury doctors like those at Southeast Orthopedic Specialists work to heal shoulder and other conditions through non-invasive treatments and physical therapy first. Call us today for more information.